I secretly want to be a conductor of a large musical ensemble. My visits to the Toronto Symphony Orchestra always reignites my passion for music and I will always catch myself using my hands and body to dance with the beautiful arrangements of the melodious notes. However, one small obstacle has barred me from realizing this dream: I have not yet been able to master any instruments much less lead a body of musicians. Sigh! Nonetheless, being a teacher gives me the opportunity to integrate many of my passions into my classroom practice. As such, my love of teaching and my dream of conducting an orchestra have a place to collide. My class call signal – teacher: “Bah dah bump bah dah dah…” students: “Hey!” – can seem to go on for hours as I engage my students in various melodious versions of the common tune. Needless to say, I can totally get lost in the call and response clap patterns that allow me to use my hands as if they were conducting an orchestra, pulling out the very beat of each note value as students respond with the exact arrangement of claps. Each time I am left invigorated and excited and my students love it. These sessions often end up with smiles and laughter in our classroom, opposite to the quiet tone I originally was trying to achieve. This year I teach math to Primary, Junior and Intermediate students. 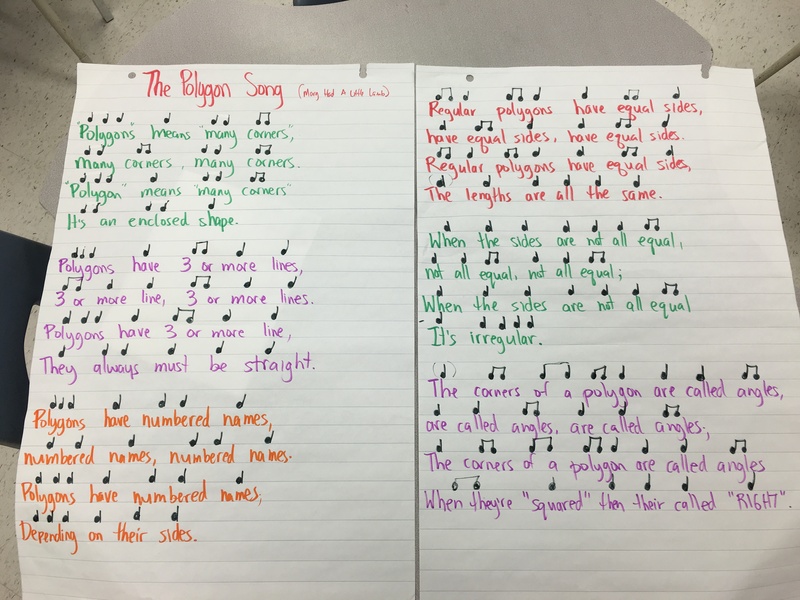 Math and music have long enjoyed a harmonious marriage with the plethora of interconnected concepts that can be explored simultaneously. This year in my Grade 3/4 math class, we had the opportunity to embrace this fusion. We have been exploring geometry concepts by naming, sorting and identifying characteristics of polygons. This aspect of geometry is extremely language-rich and I needed a way to solidify the students’ conceptual understanding of the principles of geometry while not losing my students in the barrage of its discourse. So we decided to accent our learning by capturing it in a song. 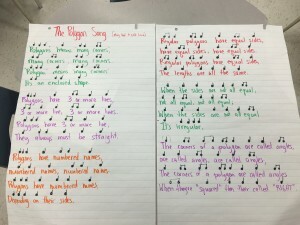 I invited my class to decide on a familiar tune that we could arrange our lyrics to fit. Hot Line Bling and Watch Me (Whip/Nae Nae) were among the tunes that were suggested, but didn’t make the cut. We opted to use the infamous Mary Had A Little Lamb as our melody base since it offered a simple structure for the type of song that we wanted to construct. We then brainstormed all of the ideas we had learned up to that point in our polygon journey. These were written on the board and were the ‘meat and potatoes’ of our song. Then the creative juices began to flow. Each aspect of our learning was written as a verse in our song. We had to be creative with our word choices and syncopation, as we had more to say than the structure of our tune would allow. So once the lyrics were written, the music teacher and I collaborated to hash out the note values of our song. Ta-dah! Music literally met math. Coupled with this, Mary Had A Little Lamb just happened to be the song that my students just finished learning to play on their recorders. Bazinga! Music met math again. And guess who got to direct this beautiful masterpiece?… ME! I thoroughly enjoyed reading this article. Music crosses all subject curricula boundaries is so engaging. Kids always respond well when elements from music support and enhance the subject being taught – and this applies to all levels – K to 8. As a former music teacher, now a retired administrator returning on contract, thanks for your infectious enthusiasm.